I’m not really a fan of mesh chairs, however I decided to write a Boss Mesh Back with Pewter Finish Task Chair review, for the simple fact that this one isn’t insanely overpriced like some others. 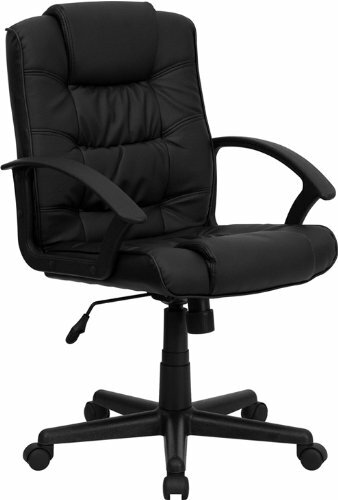 I like to provide an honest review regarding office equipment, and the chairs are my favorite. If you choose the wrong chair you are essentially putting your own health and your work flow in danger. An office chair is the most important item in your work area, it is vital to have one that actually fits your current and future needs, and I’m here to help you find the best one for you. This mesh chair is beautifully upholstered in black leather with a black (breathable) mesh for your back. It also contains an adjustable tilt tension control, and a lift seat height adjustment. The pewter finish for the base of this chair is what stands this chair out from the crowd. What I also like is the stylish looped arms that also has the beautifully-presented pewter finish. What I typically find very useful that this chair offers, is the adjustable tilt tension control. Believe it or not but not all chairs have this feature, and oftentimes a lot of mesh chairs fit into this category. The upholstery is actually done quite well and something that caught my eye from the get-go. However what struck me the most was how comfortable this chair is. I would have never thought that it would be comfortable at all due to the mesh being such a hard material – this one is surprisingly comfy. You can purchase this chair from Amazon.com, which is currently available for under $80. This also includes free shipping with a 1 year limited warranty where you can send the chair back for a full refund or send it back for a repair if something ever happens to it. This would work wonders for a student wanting to get some valuable work completed or someone that works from home and in their home office all the time. Because of the unique look that this chair provides, I find that it would fit perfectly for small business owners or someone who has to sit down for 8 hours a day (taking into consideration that you’re taking routine breaks of course). Even if you want to cover up some corner space this would work extremely well due to the base being smaller than others, it fits easily into tight spaces. As much as I’d love to praise the hell out of this chair, I simply can not recommend it to everyone. It’s only a medium sized chair, meaning it’s not designed for anyone that’s over 6 feet tall. If you are, you are just going to be slouching and sitting really uncomfortably which I don’t want to see happen to you. I would rather you check out the Serta Office chair. The mesh back that this chair has is designed so well that it actually helps support your back, keeping your back at a good posture, making it almost impossible to slouch! Because it’s not the best choice for tall people and not going to last you for many years, if that’s what you’re looking for then I’d rather you check out my review on the Serta Office chair. If you simply aren’t a fan of the mesh back that this chair offers, but still want an office chair to fit you perfectly while still sitting in the same price range, the AmazonBasics Mid-Back Office Chair might be better for you. I am not no Shaq so this chair works great for me, so for anyone shorter than 6 feet, I would say this is a a great choice, especially if you’re on the smaller side or a teenager that needs a seat to sit in for hours trying to get homework finished. Because this chair is constantly sitting under $80 and fits just about any office environment, for that simple reason alone, makes this chair stand out from its competitors – so I would say this chair is highly recommended! If you work from home, you may or may not know that you NEED a comfortable chair to help with work production. I know how important it is to have a chair that is actually going to keep your lower back supported while keeping you pain free. And because the design of the mesh back that this chair contains, it stops you from slouching tremendously, which is the most important aspect when it comes to your future health and stopping back issues. For that simple reason, and because a mesh chair in this price range with this amount of comfort isn’t easy to find, then this chair is highly recommended! Unless you’re over 6 feet tall, then no. I own this chair, and absolutely love it! We have had the chair for about three years now, and it has held up beautifully. I think your review is spot on. Great work! That’s great to hear man! I think for that price, it is well worth it, right? I got some pleather chair at K-Mart in the past and it was like $90 on sale, but being that it’s not real leather, it fell apart. This is definitely worth more than that chair and you really can’t beat the price. I too work from home and I’ve owned several desk chairs over the years and I always seem to have to buy a new one ever year or two because they were cheaply made. I’ll definitely look at getting this one thru amazon. Definitely one to consider Sam! Great review! What chair you use is really important, especially if you’re going to spend many hours a day using it. When I first started my online business I used a chair from the dining room! That thing worked but was mainly because of my work ethic. After getting a solid office chair, I definitely get more done. However, sometimes it gets too comfortable and does cause me to be lazy. Nonetheless, a good solid office chair has a lot to do with productiveness. This chair could possibly work for me since I am only 5’5″. But I do share an office with my husband in which case this chair would be a nightmare for him since he is so much taller than me. Thank you for your honest review. It is highly appreciated it! Yeah you can always get two chairs, but you definitely want to get just one that can suit both of you. Looks like a good entry level chair. I think for most people, this will do fine. What do you expect for under $80? It’s good to get reviews and recommendations on things like this because I eventually plan on working from home in the near future. The chair I have now hurt’s my left leg for some reason. Your site seems to give a honest opinion so that I can weigh my options. This looks like a great bargain for being less than $80. I happen to like the feel of mesh chairs and I’m just under 6 feet so this sounds like a win win for me. It is also nice to know that this chair is easy to assemble and doesn’t squeak. I will give this chair a serious look when I am in the market, thanks! Yes, this is something to consider if you are on a budget (or not), so give it a try! From reading your review, I would say that this would be a good chair for a student. And the price is affordable also. I’m curious. Did you give it a lower rating because it might not be a good fit for someone over 6 feet? Great review. I think the rating is fair, as there are just a lot better chairs out there than this one. However, this is one that fits almost everyone’s budget and it does a lot better of a job than most overpriced office chairs.